Automaker extends shutdown of Japanese plants beyond previously announced three-day hiatus. 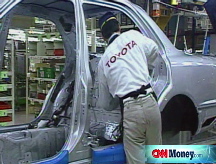 TOKYO, Japan (CNN) -- Toyota announced Tuesday it will idle all 12 of its wholly owned factories in Japan for an extra 11 days in response to the slumping auto market. The company already had announced a three-day shutdown, which was set to begin in January. Company spokesman Paul Nolasco said the longer stretch, scheduled for February and March, will help the company get through the downturn without cutting jobs. "In good times and bad, we try to keep output in line with demand, keeping production in line with demand," Nolasco said. "This will help even out production flow." Three of the factories to be shuttered are auto assembly plants, while the rest make parts. Expanding that shutdown is a rare move that is likely to produce a ripple effect among its suppliers of parts and raw materials. The announcement followed dismal numbers posted Monday by the Big Three U.S. manufacturers. Chrysler saw December sales decline 53% from last year, while General Motors (GM, Fortune 500) saw its receipts drop 31% and Ford (F, Fortune 500) dropped 32% . In December, Toyota (TM) warned that that it would report its first loss as a public company. Toyota, Honda and Nissan all reported an annual drop in U.S. sales, the first time there's been such a broad-based decline for those powerful Asian brands. A week earlier, Honda (HMC) slashed its earnings forecast for 2009 and said it saw "no prospect for recovery" in the midst of a widespread downturn.